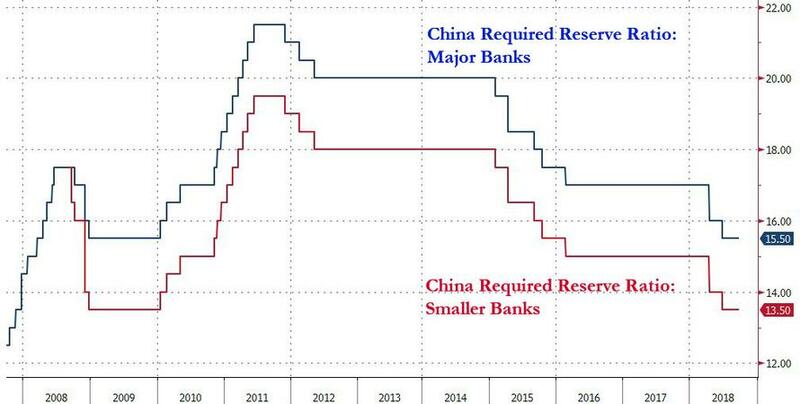 China's central bank announced it would cut the Required Reserve Ratio (RRR) for most banks by 1.0% effective October 15 for the fourth time in 2018, a little over three months after the PBOC announced a smaller, 0.5% cut on June 24, as Beijing seeks to stimulate the slowing economy amid the growing trade war with the US, a slumping stock market, a sliding yuan and a record number of bond defaults. Commenting on the cut, Goldman economists said that while they had been expecting one RRR cut per quarter in H2, "the 1pp magnitude surprised us on the upside." To some, the RRR cut was expected: Karine Hirn, from East Capital in Hong Kong, said that "weaker PMI, negative development in U.S.-Sino tensions, poor weekly performance in Hong Kong during the past week while the onshore equity markets were closed made most investors expect some kind of supportive announcement over the weekend ahead of the reopening on Monday." And, never one to disappoint markets, the PBOC delivered right on schedule. Concerned about the US response to what will be perceived as its latest easing action, one which could lead to further yuan devaluation, the central bank argued in a separate statement that the move won’t affect the overall amount of liquidity in the economy, as it substitutes for existing instruments, and the remaining money will offset the tax-payment pressure in mid-to-late October. Additionally, the PBOC claimed that the cut won’t put depreciation pressures on the currency, although it is unclear if the US will accept that explanation at a time of escalation economic and geopolitical tensions between the two nations. 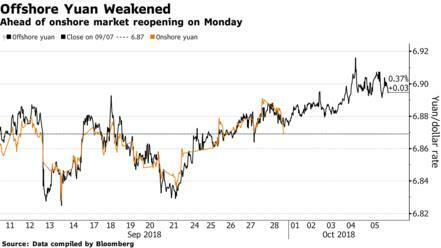 China's central bank has been reacting to the cyclical slowdown that’s been worsened by Beijing’s anti-debt campaign and the building trade conflict with the U.S. As a result, the PBOC has maintained an accommodative monetary policy even as the yuan has continued sliding. 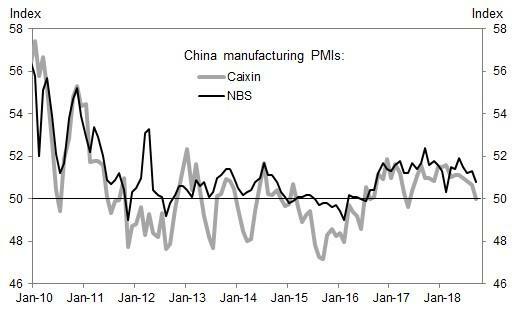 However, the effects of Chinese policy support plus tax cuts and increased infrastructure funding have yet to fully filter through though, and economic momentum continued to lose pace in September, with the Caixin manufacturing PMI last week dropping to 50, ending 15 months of expansion and the lowest level since May 2017, while the official PMI recorded its first September drop since the PMI series was released. Reflecting the escalating trade war with the US, new export orders fell to the lowest reading since 2016. “China’s monetary policy is still prioritizing domestic economic problems, despite the escalating trade war and Federal Reserve tightening,” said Ming Ming, head of fixed income research at Citic Securities Co. in Beijing. “The reduction will help ease domestic financing difficulties,” he said. The RRR cut also comes at a time when China's deleveraging campaign has resulted in a record number of bond defaults. According to Goldman, just in August and September of this year, there had been no less than 8 new defaults, a troubling trend "despite the introduction of a number of policy loosening measures in early July." This compares to only 11 new defaults between January and July this year, with all the recent defaults coming from privately owned enterprises. The recent cluster of defaults has brought the number of new defaults this year to 19, surpassing the previous full year record of 18 defaults recorded in 2016. 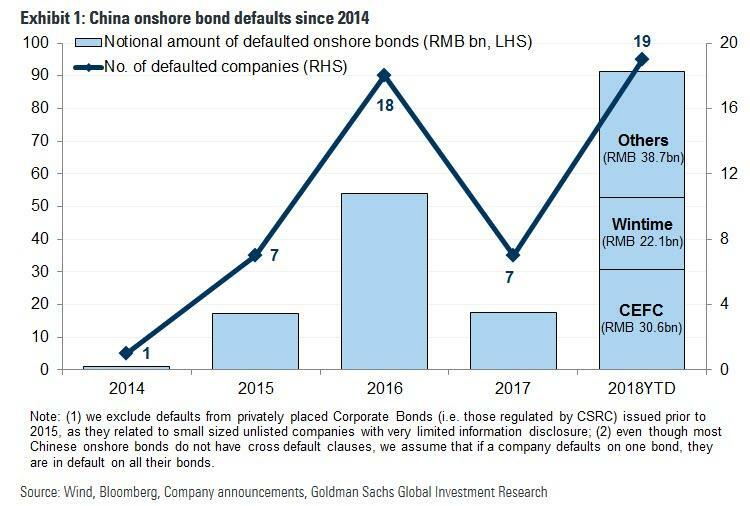 In terms of the notional amount of bonds that defaulted, it has reached RMB 91.4bn, equivalent to 0.5% of corporate bonds outstanding at the start of 2018, and 69.6% higher than the RMB 53.9bn recorded for all of 2016. The increased liquidity from the RRR cut will help support slowing bank lending and credit, and unlike the PBOC’s medium-term funding tools, it is permanent "which can help banks’ liquidity expectations", said Wang Tao at UBS. The cut gives the market a stronger easing signal and can support sentiment, which has been negative on China and emerging markets in the past few days, she said quoted by Bloomberg. 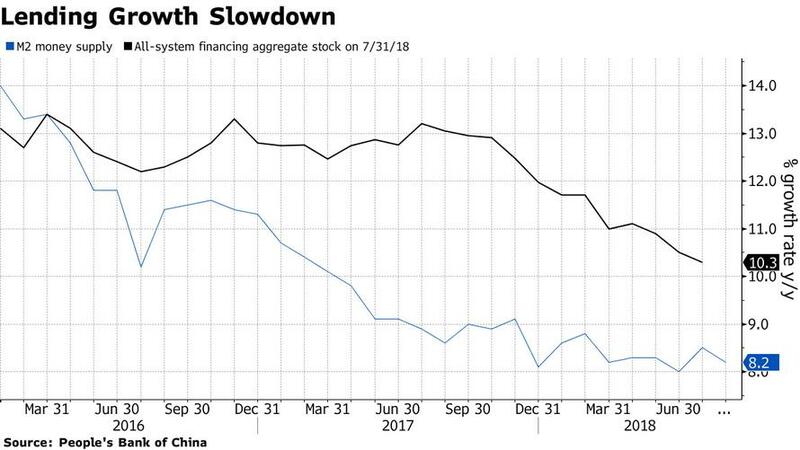 In addition to the slowdown on the economy and in aggregate lending, as well as the decline in the stock market and the rising defaults, trade war has been a key risk for Chinese policymakers. The lack of progress in negotiations between Washington and Beijing over their trade rivalry means that there’s a good chance the current roster of tariffs on $250 billion of Chinese goods exported to the U.S. will grow, as President Trump has threatened. The US imposing tariffs on all Chinese imports is now the base case for both JPMorgan and Goldman Sachs. With little room for optimism on external demand, the outlook for China’s economy hinges increasingly on the effectiveness of targeted stimulus measures being rolled out this year. Meanwhile, with Chinese markets shut last week due to holidays, the onshore currency hasn’t traded, although in that time the the offshore yuan has lost almost 0.3% of its value against the dollar as turmoil from sharply higher rates has hit global markets.